Slimspec is an Acoustic Radial Wave Therapy (ARWT) system for treating cellulite and firming the body. Using acoustic radial waves to treat the cellulite in unwanted areas, your body responds by increasing its metabolic activity. As metabolic activity increases, oedema tissue (a main initial phenomena of cellulite) is reduced, helping to aesthetically remove cellulite and firm the body. How Does Slimspec Cellulite Reduction Work? 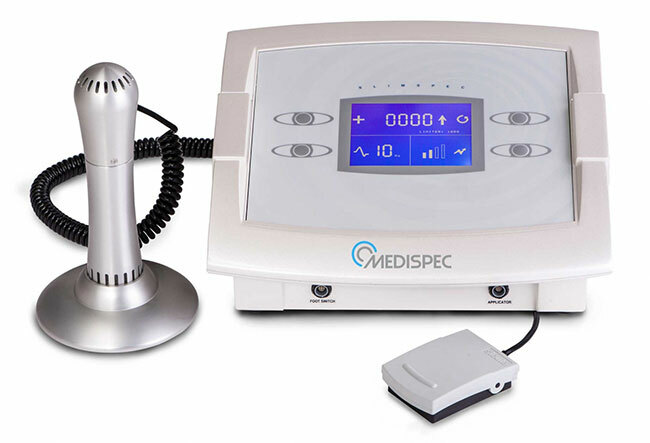 Based on the radial waves adapted to efficiently treat dermatologic and cosmetic conditions, Slimspec Cellulite Reduction uses acoustic radial waves to stimulate collagen structure and skin connective tissues. The blood circulation and metabolism of the fat cells are improved, while the fat tissue oedema is reduced. Ultimately, the lymphatic drainage of toxins is improved, helping the skin become more elastic and visibly firm. Each Slimspec Cellulite Reduction treatment lasts 20 minutes and is recommended to be repeated twice per week for six weeks. The effect of this entire regimen provides a long-lasting effect of up to six months. Q: How long does a Slimspec Cellulite Reduction treatment appointment take? A: The treatment itself could take up to 20 minutes. Q: Does a Slimspec Cellulite Reduction treatment hurt? A: No, the treatment is completely painless with no reported side effects. Q: What results should I expect from a Slimspec Cellulite Reduction treatment? A: Expect to see a visible reduction in the appearance of cellulite and a gradual smoothening of your skin’s surface. Q: Is there any downtime from a Slimspec Cellulite Reduction treatment? A: No, this treatment is non-invasive and requires no downtime.